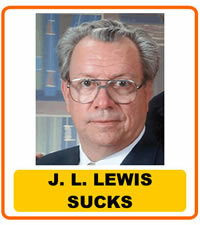 J. L. Lewis is an El Paso Pentecostal preacher who founded the El Paso School of Excellence and further claims to be able to cure cancer. J. L. Lewis purchased his Doctorate in Theology online a few years ago and often identifies himself as Dr. Lewis, a specialist in homeopathic medicine. J. L. Lewis founded the El Paso School of Excellence, a Texas Charter School, sometime around the year 2000, opening for business soon thereafter. Throughout the charter school's short history there has been a tradition of nepotism and religious discrimination in the employees of the school. If you went to J. L. Lewis' church, you had a job whether you had any experience in teaching or school administration or not. If you were related to J. L. Lewis and lived close enough to make it to the school, you had a job. If you were his son-in-law and didn't live within 500 miles of the school, you had a job. Not only did these people have a job, but none of them ever had to demonstrate any ability, adequacy, sufficiency, or anything resembling any capabilities or talent that a given position may require. There is the Science Teacher who attended the church of J. L. Lewis. He became a teacher shortly after the El Paso School of Excellence opened. For years there were sporadic allegations of impropriety between Science Teacher and certain female students. However, J. L. Lewis refused to terminate Science Teacher's employment for years, until 2006, when Science Teacher had to be terminated. I don't remember seeing any of that on the news. There is the man who, at the time, was J. L. Lewis' co-preacher at his Pentecostal church, Juan Ramos III. This man went to work for the El Paso School of Excellence immediately, helping J. L. Lewis to found the school. Juan Ramos III did not have a High School Diploma, a High School Equivalency GED or any other academic training or credentials. J. L. Lewis eventually made Juan Ramos III the High School Principal. Juan Ramos III had convinced J. L. Lewis that a Mrs. Runkels, who was the high school principal in 2002 or 2003 and who actually had some academic credentials, was full of demons and had to be terminated. She was terminated and Juan Ramos III was made the High School Principal, even though he never finished high school himself. There is also Son-in-Law, Dennis Green. His job with the El Paso School of Excellence for years consisted of obtaining book donations, which were dumped into a large room where many reside today, completely untouched and just as old and moldy as the day they were donated. Dennis Green was paid thousands of dollars per month to obtain useless donations. He lived in Dallas and was only seen sporadically throughout the year, although he was a full time employee. He is J. L. lewis' son-in-law, after all. J. L. Lewis and Dennis Green have been working hard to open a new charter school in some other state. There is also High School Girl's Basketball Coach, who is a former car salesman who convinced J. L. Lewis that he would make a great girl's basketball coach. His level of inappropriateness with the girls in his class are legendary within the school. He would buy one of his female students lunch from restaurants and have it delivered to her at school. This man also taught a class in one of the computer labs. Many, many, many times it was reported to J. L. Lewis that some seriously inappropriate and pornographic internet browsing was occurring in that computer lab, and that some of it was occurring at night when no students should be present. High School Girl's Basketball Coach had a habit of spending evening's in the computer lab during that same time period. High School Girl's Basketball Coach once bit a female student in a swimming pool while another teacher was teaching a swimming class. I don't remember seeing any of that on the news. Then there is Art Teacher, whose mother is is an EX-TEA worker who was the High School Vice Principal for the El Paso School of Excellence. She was there when Mrs. Runkels was terminated due to demonic possession. Art Teacher has a long history of laxness with her students regarding internet browsing. In October of 2006 it was discovered that full length pornographic videos were being viewed on multiple computers in her classroom during classroom hours. When asked about it, Art Teacher and her mother, the Vice Principal threatened to sue J. L. Lewis for slandering them. J. L. Lewis caved in to Art Teacher, and I've never seen a story about how the El Paso School of Excellence allows students to view full length pornographic videos on the news. Then there is Super Secret EX (or is he still?) DEA Agent Guy, who was given a job after explaining that he was a former DEA agent who was so secret he has now likely been framed for something or other and must strive to clear his good name. I never really understood the explanation other than that he was an ex DEA agent who was super secret but couldn't prove it due to the circumstances surrounding his super-secrecy. J. L. Lewis made the man a high school teacher. I would absolutely love to see some news organization do a story about super secret ex-DEA agents who now work in Education while clearing their good names. I would probably pay to watch that.